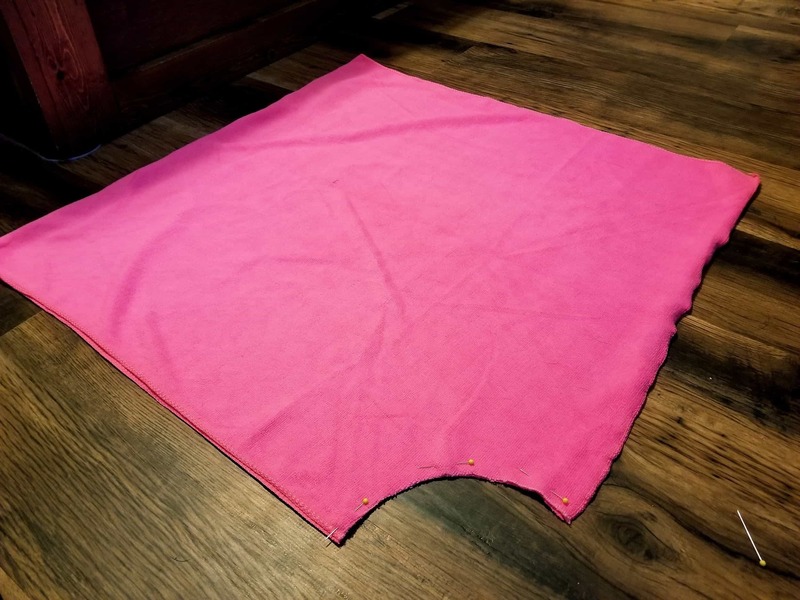 Simplify your trip to the beach or pool with an easy beach towel cover up. There is always so much to carry between your towel, cooler, snacks, sunscreen, and the list goes one. 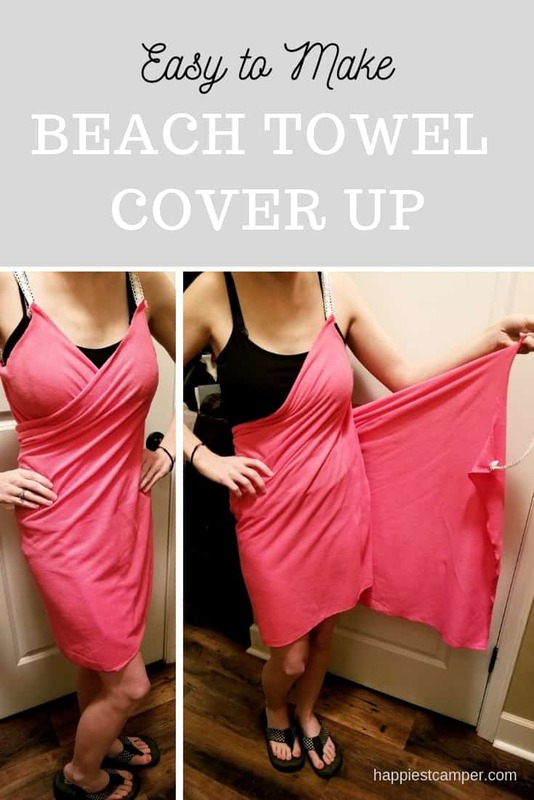 Turn your beach towel into a cover up so you can wear it instead of carrying it. Plus, it’s adorable! 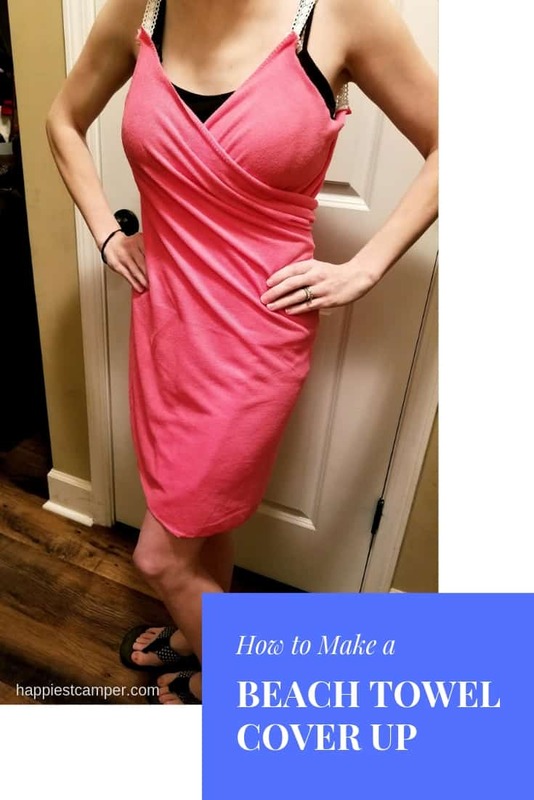 This idea is genius because the terry cloth will continue to soak up moisture as you wear it. No more awkward wet spots on your cover up. The wrap design stays in place nicely too. Choose a beach towel that will fit your frame. For a small frame, make sure the towel is at least 60″ in length. A medium frame should use a towel that is at least 64″, and a large frame will want 70″ in length or more. 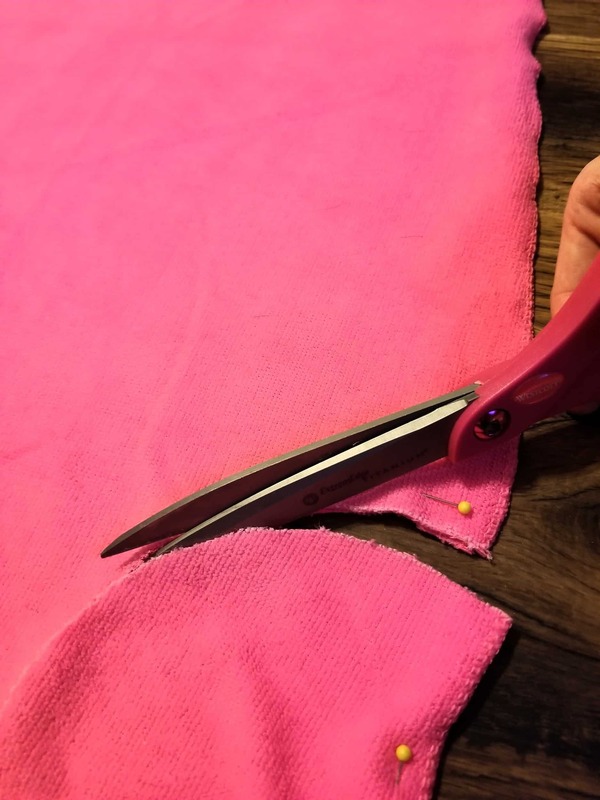 You can also make the beach towel cover up without a beach towel at all by cutting a piece of terry cloth. 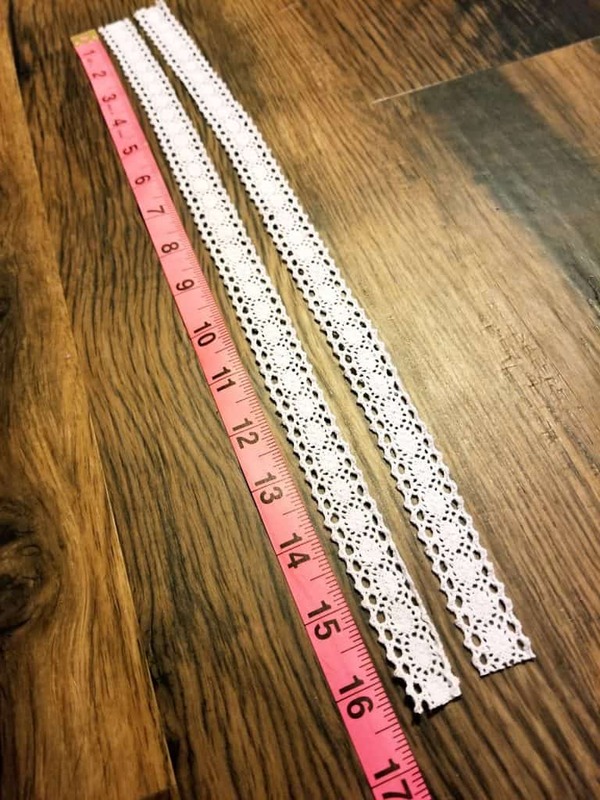 Measure around your body twice to determine your custom length. When choosing a ribbon, keep in mind it will rub against your freshly sun-kissed skin. 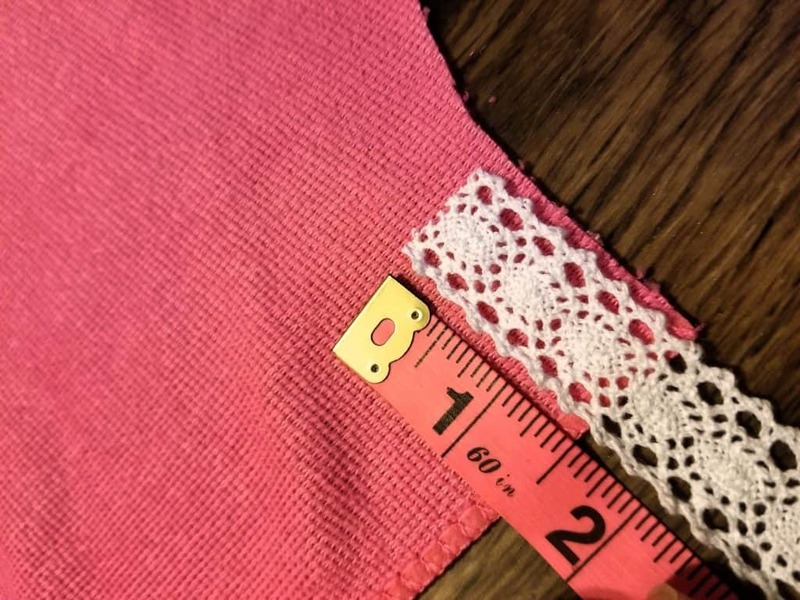 A 100% cotton lace ribbon is a nice choice. Start by laying your towel out flat, facedown. Fold the towel in half lengthwise so that it forms more of a square. Select one corner where the two ends meet. Line the two corners up then pin to secure the two layers together. Keep in mind that this will be the top of your cover up if you are using a towel with a pattern. Using your marker, mark the towel at 4 ½” from the corner. Repeat this step on the adjacent edge. Align the mixing bowl with the two guide marks from the previous step. Trace the curve of the bowl connecting the two guide marks. Rearrange pins as needed to keep the two layers in line while cutting. Cut along this line. 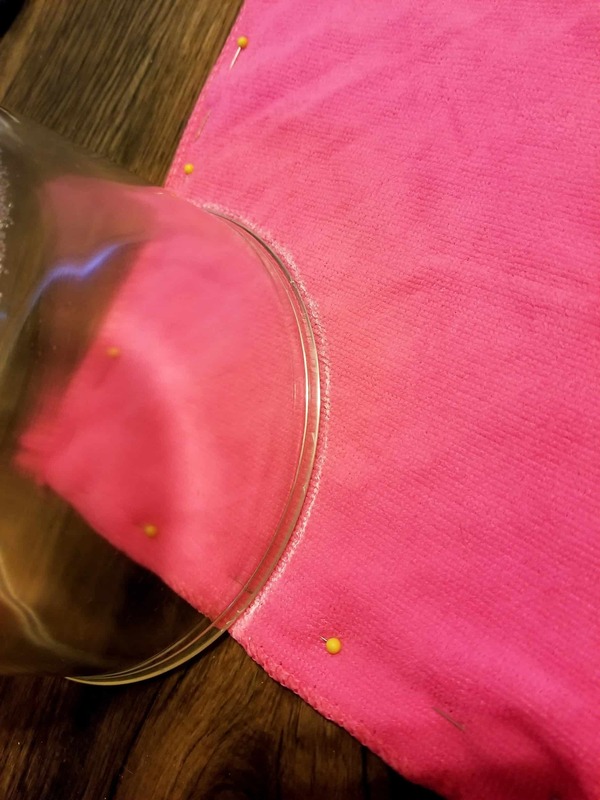 Remove straight pins. You will now have half of your arm hole. Unfold the towel back out face down. Where you cut out the corner you will now be left with two “new” points on each side of the towel. This is where you will connect your ribbon. Cut two pieces of the washable ribbon to 16 ½” long. 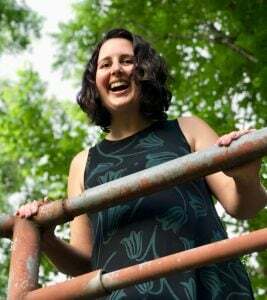 Adjust this length as necessary to fit loosely around shoulder area. Overlap 1 ½” of the ribbon with one of the “new” points. Now fold half of the 1 ½” ribbon overlap underneath itself. It will be like you are tucking it under itself so that it will not unravel. Pin the ribbon in place. Repeat with the other “new” point ensuring the face of the ribbon is facing outward. You will now have a strap. Now attach the other 16 ½” piece of ribbon to the opposite cut out using the same steps. 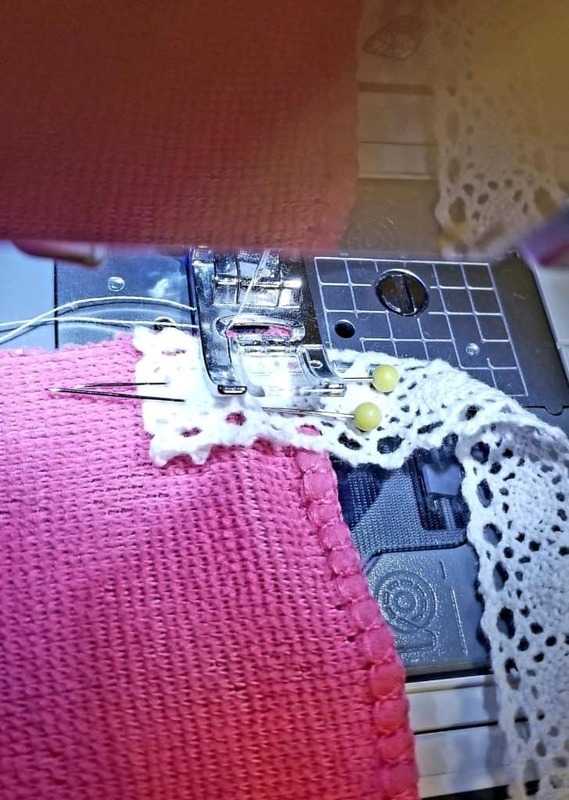 Set up your sewing machine to do a straight stitch. You can hand sew this if you choose to do so. 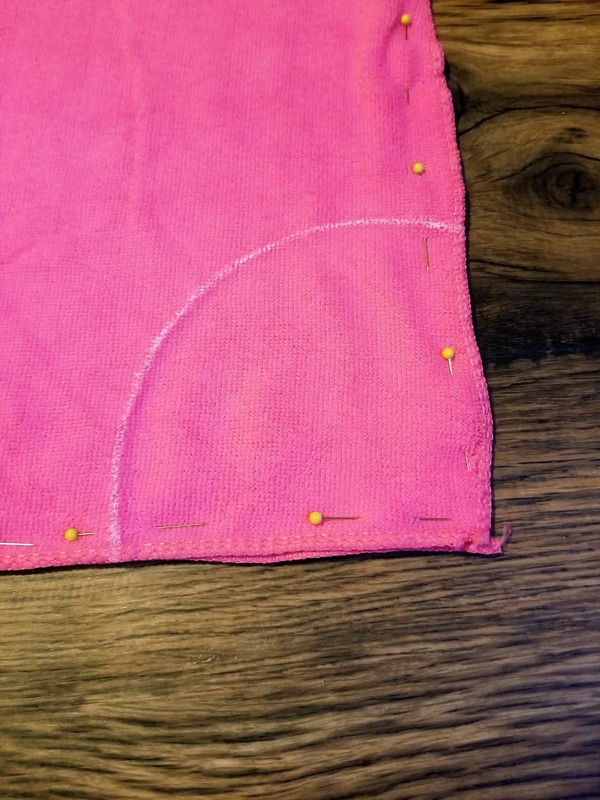 Line the needle of the sewing machine up so that it is below the hem of the towel. This should be approximately ½” from the edge. Sew perpendicular across the ribbon. It is recommend to sew over the ribbon twice to secure. Start and finish with a back stitch. 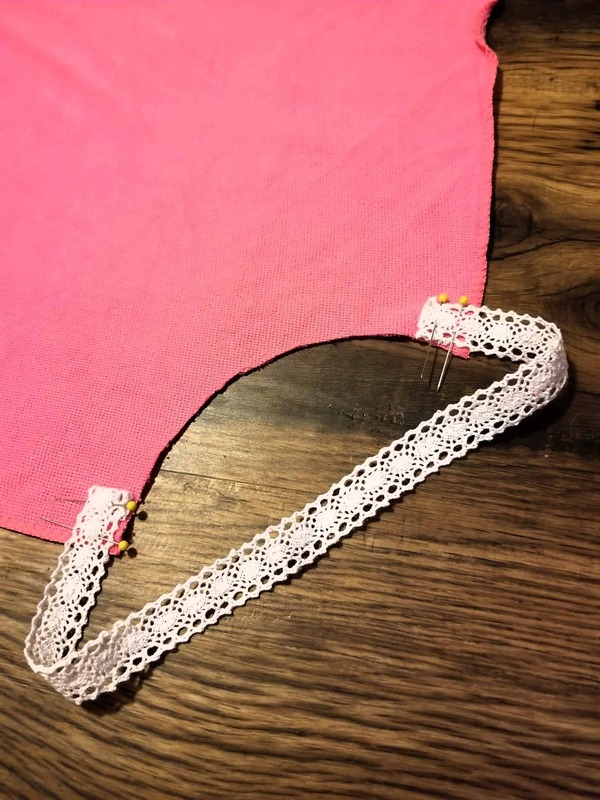 Repeat with the remaining three points of pinned ribbon then cut off any loose threads. 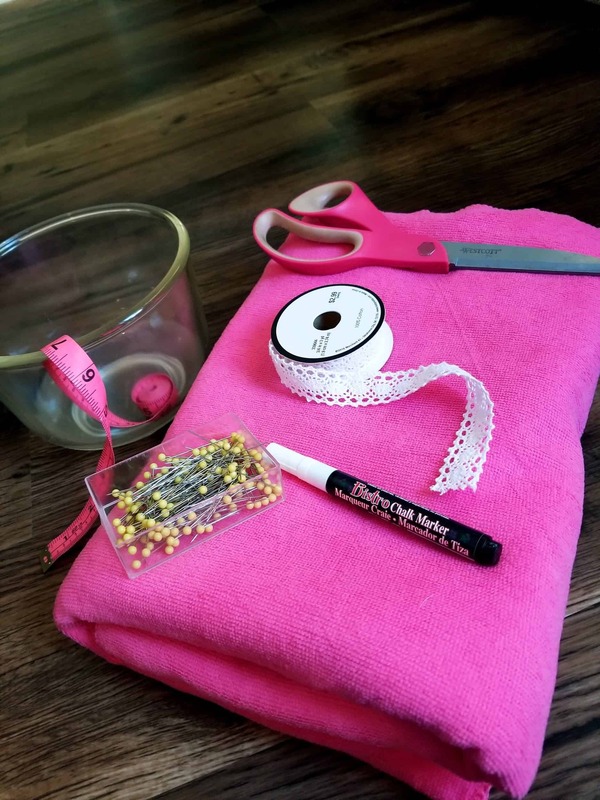 Optional: You can add fringe or ribbon to the edge of your towel to give it a little extra embellishments. Something like this would be really fun too. Congratulations! 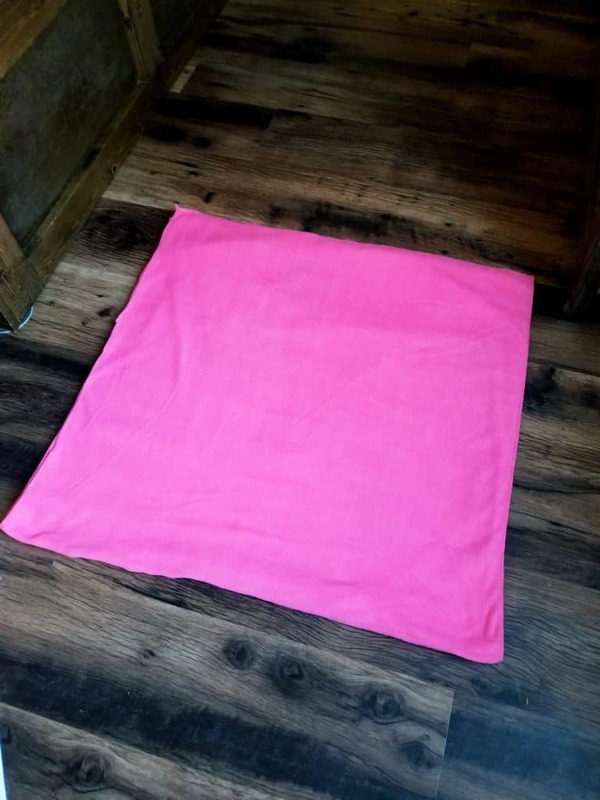 You made an easy beach towel cover up that is sure to get lots of use at the beach and pool. To wear the cover up, open the towel with its back facing toward your body. 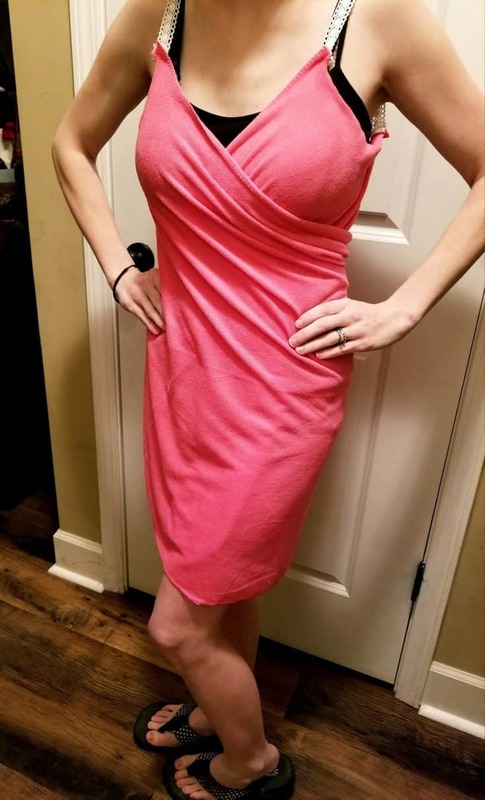 Put your left arm through the left strap, then wrap down and around you body ending with your right arm through the right strap. If you have a daughter, please put together a pool party and make these for all the guests. Then send me pictures because that would be the cutest thing ever! Transform a large beach towel into a stylish cover up. Using your marker, mark the towel at 4 ½” from the corner. Repeat this step on the adjacent edge. Align the mixing bowl with the two guide marks from the previous step. Trace the curve of the bowl connecting the two guide marks. Overlap 1 ½” of the ribbon with one of the “new” points. Now fold half of the 1 ½” ribbon overlap underneath itself. It will be like you are tucking it under itself so that it will not unravel. Pin the ribbon in place. Repeat with the other “new” point ensuring the face of the ribbon is facing outward. You will now have a strap. Now attach the other 16 ½” piece of ribbon to the opposite cut out using the same steps. 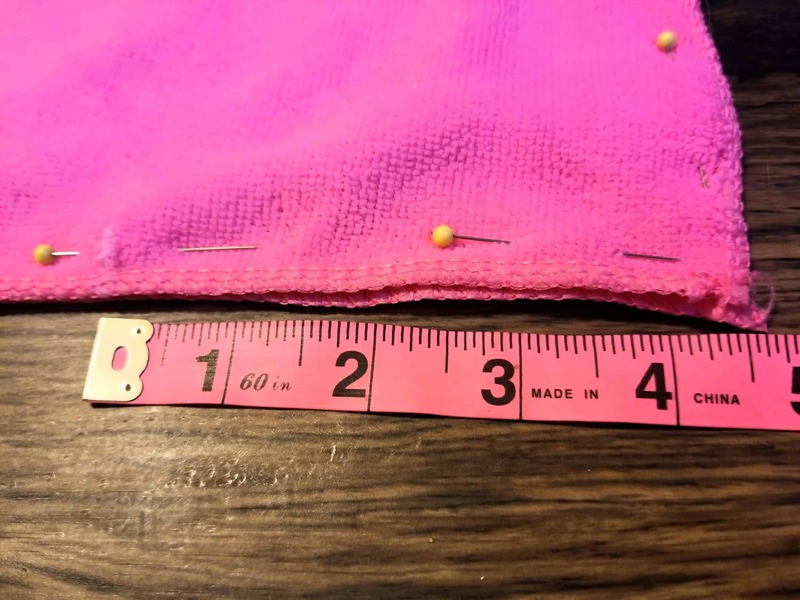 Making your own from terry cloth: Measure around your body twice.